So two days ago I published a more personal post about how I was feeling having bloggers block and pretty much the ins and outs of what was going through my mind. I have to say as a blogger who has grown from posting once a month, to once a week and then four times a week in the matter of months and growing this to posting every single day for seven months; going through bloggers block feels like absolute hell. Blogging is a part of my daily life now, while also being a student and working; I make time in each day to do something around my blog whether this is jotting down notes or writing up blog posts or even taking pictures; I will always do something blog related every single day. I've had bloggers block for I'd say two months now, maybe more. However, I have still continued to post every day because it's what I love to do and if I don't do it, then I'll be disappointed with myself. 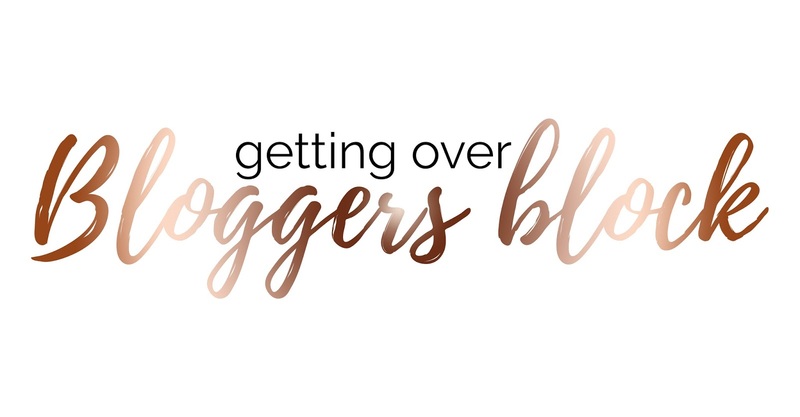 In the past week as I have been off work I have been trying to figure out ways to feel motivated and inspired again, to get out of this horrible feeling of bloggers block. Now I'm going to say in now instead of later, I'm still in this circle of dread. I still have bloggers block and I still feel unmotivated but every day I'm doing everything I can to get out of it. I'm usually the one who has notepads absolutely full for the next few months but for the past few months; this hasn't been the case. Actually today is one of them days for instance. I didn't have a post planned for today because I haven't felt inspired, but of course I needed/wanted to post. I'm finding writing down everything in a notepad is making this situation so much easier. If I have a brainwave, I write it down. If I have a sudden urge of inspiration and creativity, I write it down. My notepad is my saviour right now. Obviously when you're feeling absolutely rubbish and quite negative, you just need to surround yourself with positivity. Speak to people who make you happy and those who bring this positivity into your life. Think positive every single morning as soon as you wake up. While also finding the positive side of every situation. You might feel down now, but tomorrow's another day. Last but not least, if you're struggling with inspiration, then find it. Have a browse through Bloglovin or even Pinterest or Instagram. Social media will be your best friend during these difficult times. But if you do not want to result to social media then the outside of your bedroom is your next best thing. Find those things which make you happy or bring joy to your life and write about them. For me, I have been writing a fortnightly diary of how Willow is growing up and getting on and I know so many people have been loving these posts. But I also have an incredible weekend planned in the sunshine where I'll definitely be taking my camera. Find the things you love and write about them. I hope you have a lovely day and find positivity in whatever is bringing you down. "Find the things you love and write about them." Love that sentence! It sums everything up nicely. Because that really is the key, isn't it? There's no better inspiration than just discovering something new to love or maybe rekindling an old passion you'd forgotten about somehow and writing about them. I've only been blogging for a few months now, but even I've already experienced the dreadful blogger's block and I think I'm going to take your advice of jotting down every single idea that pops into my head at any given time. Nothing's worse than coming up with a topic and then having forgotten about it the minute you sit down at your laptop to start typing!